Mayor Rahm Emanuel lays out his plans for a police task force at a City Hall news conference Tuesday. CITY HALL — Mayor Rahm Emanuel attempted to ease tensions in the city this week by creating a task force he hopes will help repair the damaged relationship between police officers and the communities they serve. 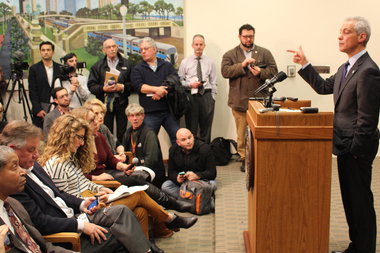 At a City Hall news conference Tuesday where he also announced the removal of Police Supt. Garry McCarthy, Emanuel said the Task Force on Police Accountability would be charged with the assignment to "build the trust and confidence in the public" for police activities. "We face our own questions and our own judgment," Emanuel said, in charging the panel to perform what he called a "top-to-bottom review of the system." Emanuel added that the task force would also set policy on the release of police videos, saying that it would have to reconcile "two conflicting principles": the public's right to know and the need to maintain the integrity of ongoing investigations. "We want to hear the community," says Ald. Ariel Reboyras. Emanuel said he would not allow videos to "compromise, taint or otherwise hinder" police probes, but pointedly added, "How do we assure that we are effectively policing the police?" Key, he said, would be probing "excessive-force cases," to create "an early warning system to help us intervene with problem officers." The group will "engage a range of community members — including victims’ rights representatives, law-enforcement organizations, youth, religious and elected leaders," according to the Mayor's Press Office. Its purpose, the statement said, will be to "strengthen the fabric of trust" between the public and law enforcement following last week's release of a video showing Chicago Police Officer Jason Van Dyke shooting 17-year-old Laquan McDonald 16 times in October 2014. Emanuel said he intended to "build stronger bonds of trust between our Police Department, the men and women who make up that department, and the communities they're sworn to serve and protect." "We want to hear the community," said Ald. Ariel Reboyras (30th), chairman of the Public Safety Committee. He added that overall crime statistics are down. "However, things are not playing too well, because of A) lack of communication and B) people need to be held accountable." According to Reboyras, police accountability is the primary issue given the current atmosphere and the protests surrounding the department. 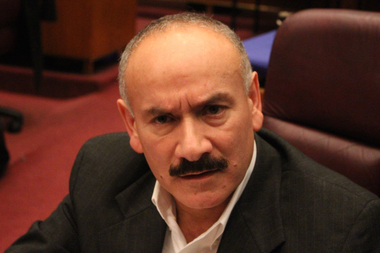 Yet Ald. Carlos Ramirez-Rosa (35th) said it was insufficient to achieve those aims. "Chicago doesn't need more closed-door meetings, we need an independent investigation, and a transparent and inclusive conversation on police accountability and reform," he said. He called McCarthy's resignation "a step in the right direction," but added that "the council must now work to hold hearings on police accountability and support an independent investigation that will give us a full account of what appears to be an official cover-up of Laquan McDonald's murder." State Attorney General Lisa Madigan formally asked the U.S. Department of Justice to probe the Chicago Police Department in a letter released Tuesday. "The shocking death of Laquan McDonald is the latest tragedy in our city that highlights serious questions about the use of unlawful and excessive force by Chicago Police officers and the lack of accountability for such abuse," Madigan said in a statement. "Trust in the Chicago Police Department is broken. Chicago cannot move ahead and rebuild trust between the police and the community without an outside, independent investigation into its police department to improve policing practices." Others, however, cheered Emanuel's initiative. "This task force is long overdue to bring much-needed reform in the City of Chicago,” said Steven Hawkins, executive director of Amnesty International USA. "We will bring our own findings and recommendations to this task force to ensure that Chicago Police meet their obligations under international human-rights standards that make it clear that lethal force should only be used as a last resort." The panel will present recommendations to Emanuel in March, the statement said. Among other tasks, the group will be charged with reviewing the makeup and mission of the Independent Police Review Authority, a civilian oversight council that examines police-involved shootings and police misconduct. The group also will determine a "best practice" for how the city should release videos of police-involved incidents, the mayor's office said. Former Massachusetts governor and Chicago native Deval Patrick will serve as a senior adviser to the task force, the mayor's office announced. Patrick also previously served as an assistant attorney general for the civil-rights division under President Bill Clinton.